I have a confession to make. As much as I love food I find I like to cook for an audience. Friends, family, and readers of my cooking columns (kind of a virtual audience) all count. So when I am alone for extended periods of time (and not on deadline for creating recipes) I actually find it hard to make a real meal for myself. Oh, I'll defrost leftovers, pour a bowl of cereal, heat a frozen ethnic meal, but it's nothing I look forward to (and usually it's not the best option in terms of calories, salt and or fat). My lack of decent meals mirrors my issues of establishing some healthy routines while my husband (my best audience) is traveling for months with one of our sons. Today I had a kind of epiphany, I could plan and share some meals for one on Blog Appetit and begin to bring some expectations and planning into my life leading to more routine and better-for-me food. 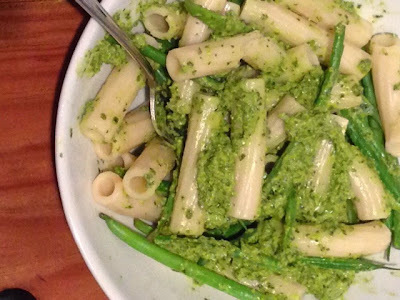 So tonight's meal for one was pasta with steamed green beans tossed with prepared pesto (I like refrigerated bolani brand with lots of garlic and no cheese). I also have some strawberries for dessert later tonight. If I need something more I'll add a dollop of yogurt. It feels good to be gaining some control over my evening meals. Next up getting to exercise class. Watch for posts with suggestions and recipes for dinners for one. My girlfriends and I are always looking for new blogs. Your blog is wonderful. I'm a huge fan of "Cooking With Mr. C." and "Food 52". I will share your blog with my friends. We love to follow many blogs.